Image button: use to run any action. Replaces the Simple button style with any image of your choice. (In fact, you assign two images: one image for when the button is untouched, another for when it is touched.) Can also have a label. Toggle Button: has two states: checked and unchecked. Each state can trigger its own set of actions. Image Toggle Button: has two states: checked and unchecked. Each state can trigger its own set of actions and can be personalized with images. Buttons can be placed into the scene either as a standalone control or can be inserted into any type of collection. This latter method, when used with Image buttons, can create very interesting display techniques for navigational control. To insert a button, either use the menu item Insert -> Button or select the Button icon in the quick action toolbar to the left of Composer. Buttons are always inserted with the Simple style. 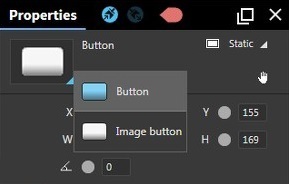 To switch between the Simple and Image styles, open the Properties panel for a selected button and modify it by clicking on the button icon displayed on the panel. Modify the Text property in the Properties panel. You can change the label, position, orientation, colors and effects from here. Fill color: color of the interior of the button. Setting the Opacity to 0 will eliminate all color. Outline color: color of the outline of the button. Setting the Opacity to 0 will eliminate all color. Pressed color: color of the pressed state of the button. Setting the Opacity to 0 will eliminate all color. Text: Visible text in the button. Leave blank if you don't want to display any text. Is pressed: Raised when the button is pressed. Is released: Raised when the button is released. We usually use the Released trigger in common UI Design. Simulate a tap: Simulate a single tap on the button. The screenshot below illustrates the set of actions specific to the Button asset. When a Countdown Interface Asset reaches 0 Then Enable the button. When a gesture is performed, Then simulate a tap on the button. This will give the user 2 choices (gesture or tap the button) to perform the same actions.